Dianne Webber makes a great mermaid. Seaview is on a routine mission when Captain Crane sees a mermaid out the observation ports. 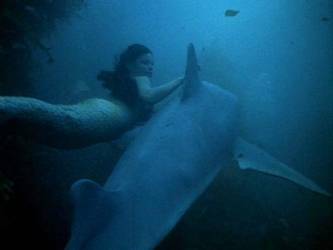 He calls Chip Morton forward, but the mermaid has vanished. Morton finds Crane's claim amusing. Crane convinces himself he's seeing things until he sights the mermaid again and reports his sighting to Admiral Nelson, who laughs even harder than Morton. 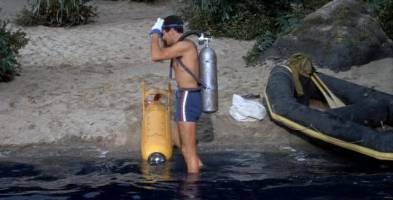 Crane pressures Sharkey into providing a raft and diving gear and gets Morton to drop him, sans backup, at a nearby island so he can pursue the mermaid. Wonderful underwater footage created by John Lamb. All of this is quite against regulations and done without the Admiral's knowledge. Crane soon locates and pursues his mermaid. 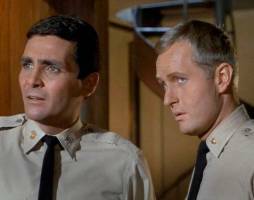 In the meantime, Nelson receives sealed orders from ONI: Seaview has three hours to find a hidden superbomb planted by an enemy power. 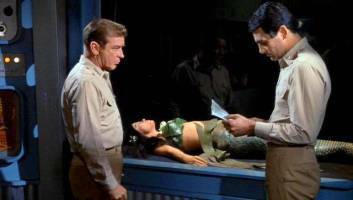 Crane eventually captures the mermaid and takes her back to the island where Seaview pick the two of them up (she's covered in wrap from the waist up) before heading toward the California coast to locate the bomb. Crane sneaks his "fish" into the lab where he ensconces her in the holding tank. Nelson is disgruntled that Crane doesn't immediately report and tracks him down. He's amazed by Crane's find, but stays focused on their mission. Crane's more focused on his mermaid than on the bomb. Big boy brute rises from the sea. Crane, on the other hand, seems mesmerized by the mermaid. About this time, a sea monster, perhaps there to rescue the mermaid (it's never made clear) gets aboard through the pressure hatch and senselessly bellows and clobbers its way up one corridor and down another. 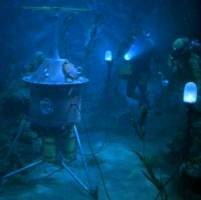 Crane comes out of his fog sufficiently to persuade the mermaid to help them find the bomb. She's successful, but about this time, the monster bellows and fights its way into the circuitry room with disastrous results: sparks once again fly and Seaview heads for the bottom. 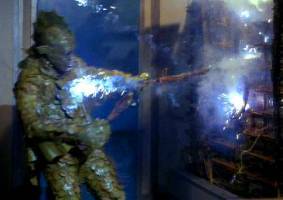 Undersea monster grooving on the crazy sparks. Now it's up to Crane and Kowalski to head out with a team to disarm the bomb with stock footage. Somewhere along the line, the monster bellows his way back to the pressure hatch and escapes. Once the bomb is defused, Seaview is free to sail into the sunset. Stock Footage disposes of bomb..
Mark Says: A real disappointment. 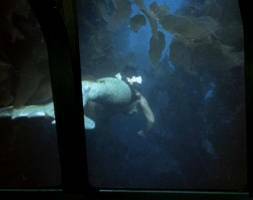 The first half of the segment really works, creating a fragile, almost mythical adventure as Crane pursues the mermaid but as soon as the amphibious monster makes its appearance at the halfway point, the creative atmosphere is totally destroyed and the beautiful mermaid�s participation is reduced to a cameo. Even the monster scenes are clumsily choreographed (you can clearly see a suspension wire on one of the crewmen seconds before he�s tossed through the air by the monster). A lost opportunity to have done something special. Mike Says: A pity to have thrown Diane Webber's wonderful mermaid into the trash bin. Delightful for the first half, much of the last half is hard to take. The damn monster bellows and bludgeons his way senselessly through much of the episode. Then he bellows some more. 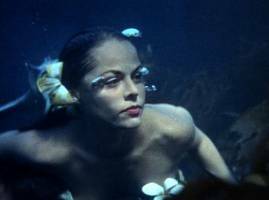 In the end, after the bomb is disarmed, the mermaid is forgotten, having had no real relevance to the story other than to eat up stock footage from Diane Webber's The Mermaids of Tiburon, which by the way, was directed by Voyage's chief underwater photographer, John Lamb. This was one of Voyage's most frustrating failures for me because it had such potential and was so viciously savaged by writer William Welch. 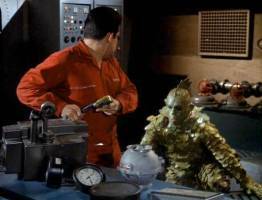 And did I mention that the monster bellows constantly to irritating effect throughout the episode?